For first timers, Le Verre Volé seems like a basic wine store with a few rickety tables, but reserve a spot one night and you’ll understand why NY Times food writer Alec Lobrano calls his favourite wine bar in the city. Located in the ever-trendy Canal-St-Martin district, the tiny bistro has become a neighbourhood staple over the past few years, which means reservations are strongly suggested for lunch or dinner, with two services in the evening. Two other Parisian locations, as well as a recently-opened Tokyo outpost, sell wine and sandwiches, but only the Canal address is fit for proper dining with reliable dishes in an unpretentious atmosphere despite the neighbourhood’s bobo tendencies. Locals will come for a bottle of the natural or unfiltered wines hand-selected from producers across France, a far cry from most wine caves. The knowledgeable staff will help you pick out something in your price range, be it for a posh dinner party or just to share along the adjacent canal with some bread and cheese. Fruity reds? Full-bodied vintages? Chilled whites for a summer’s eve? The Verre Volé has it all. With less expensive bottles hovering around €10, it’s not the type of shop to break your budget, though you certainly could. 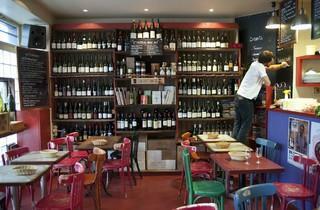 While the wine is the centrepiece, the dining is anything but below par. Rich boudin noir with buttery homemade mashed potatoes or small charcuterie plates are always on the menu. The perpetually changing daily dishes, however, are where it’s all happening, at around €23 per main course. Monkfish beignets with sea urchin mayonnaise or horse steak tartare could be tempting starters. Afterwards, a veal Saltimbocca with polenta and anchovy sauce might be pitted against octopus with mussels in a red wine reduction and a celeriac and leek purée for the main course. Pair your meal with the wine of your choice from the well-stocked shelves on either side of the cosy dining room, but it’s best to trust the staff’s suggestions – they’re all too charming to doubt. 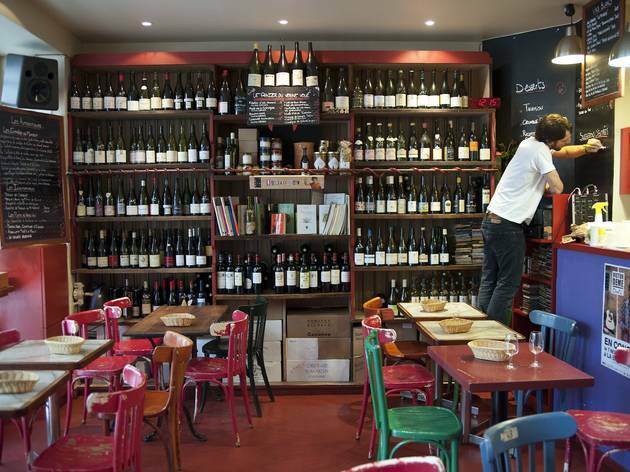 Affordable bottles and a reasonable €7 corkage fee leaves you with an entirely manageable tab for innovative, fun, yet homey cuisine while rubbing elbows, often literally, with the trendiest of Parisians. We were there last week .Terrific spot. Great food, wine, service and ambiance. Highly recommended. Don't miss it if you are anywhere near the 10th! Don't listen to the old man below- how can you rate a restaurant you didn't eat in. Really??? I'm about to write this up on my Paris Bistros website. Top marks for the food but bottom marks for the line at the bottom of their printed English menu, "service not included". What a twist! I went there in person to reserve a table two days ahead - that was no problem but I had to give the owner(?) my mobile/cellular phone number - Now I do NOT own such a device! I offered my email - my home phone - my credit card number ... asked for his email that I could reconfirm using this - was told they have none, I know they do have an email! The end was that they would not reserve a table without my nonexistent mobile number. I find it unprofessional and weird and I wonder if this attitude goes for all they do... I have decided never to go there phone number or not.